Took the CCDA Exam 640-863. | CCIE or Null! Took the CCDA Exam 640-863. Well after my two months of going through CCDA material I finally sat down and took the exam. I am happy to say I passed the exam with a score in the 900’s. 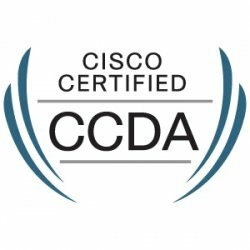 All in all it was a good experience, similar to the CCNA exam the CCDA doesn’t focus on a single topic but instead touches on multiple technologies including routing, IP Addressing, wireless, voice, security, and a few more topics so its definitely at a different pace compared to the CCNA: Wireless and Security concentrators. Here is a link to the exam topics. The exam took me about an hour (almost to the minute) so while I had time to spare it was not a quick exam. I found the drag and drops and the few questions concerning route summarization to be the most time consuming questions. It’s a good thing route summarization is like riding a bike and you just don’t forget how to do it (At least for me anyway). So I didn’t find this test to be very challenging just long winded. Something I feel that sets this exam apart from the other Cisco exams I’ve taken is this exam does not rely on you learning any new configurations as long as you are familiar with the topics already. I know Cisco lists CCNP SWITCH knowledge as a recommendation prior to starting the CCDA but not as a requirement. That’s something I can agree with, while the CCDA will not test you on the configuration or the troubleshooting of SWITCH topics (L3 Redundancy, Etherchannel, QoS, and so forth) they expect you to be familiar with them and know about these topics. Instead this exams covers more of a “best practice” solution, providing guidelines about when to break a network into multiple tiers, and it also provides a recommended practice on the network life cycle (The PPDIOO methodology). While the certification itself is nice to have under my belt, I have found the topics covered by this exam to be the most the beneficial. Even though it was less of a technical certification the knowledge about network design and best practice setup would be beneficial to any network administrator or engineer out there in the field. So, I am rather happy I was able to get this certification under my belt before Cisco retired this version. It’s material I’ve been through countless times over the last few years but never dedicated enough time to take the test until now. After this I am going to head back into the world of wireless and pursue that CWNA certification. At the same time I will be reading though this Wireshark book, in hopes of taking to the WCNA (Wireshark Certified Network Analyst) certification test later this year (Probably near summer time June/July). I am not usually one to study for multiple topics at once, but Wireshark is a tool I use fairly often and I feel it would supplement my skills/knowledge as a network analyst without hindering me at all. « Layer 1 Troubleshooting with Cisco Switches.